This guide will walk you through how to install the DUC (dynamic update client) for Windows 4.x and explain the additional Enhanced preference settings that are available. 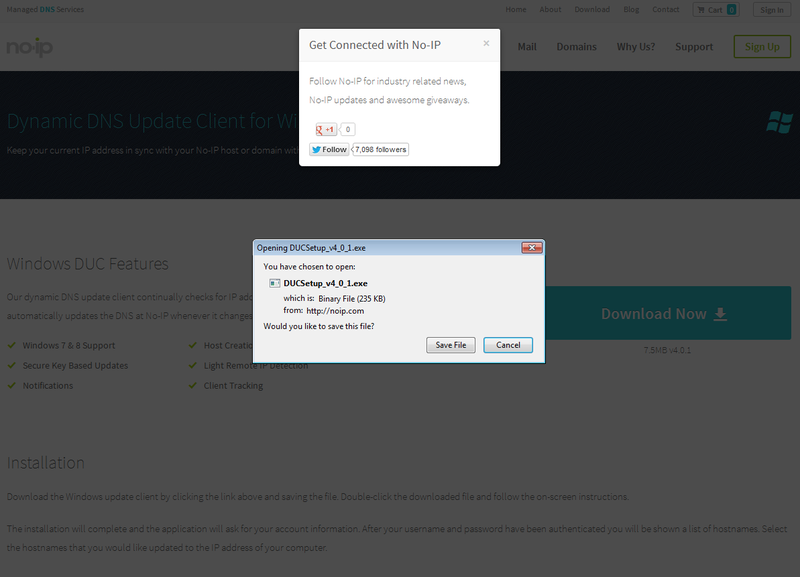 First go to https://www.no-ip.com/download and download the Windows version of the DUC. Next, open your downloads folder and double-click on the “DUCsetup_v4_0_1.exe” icon. After double clicking on the icon, choose to “Run” the installation process. Read the License Agreement and, if you agree to the EULA and the TOS, click “I Agree”. Next, select where you wish to install the DUC. A default installation directory will be used and created, if you do not wish to make changes click “Install”. Once the installation has finished, the application should launch and ask you to enter in your No-IP.com account username and password. If you chose to not launch the program at the end of the installation process you will need to locate and launch the program at a later date. To do that click on the “Start” button and then “All Programs”, find the “No-IP DUC” folder, expand it and click the “DUC” icon. You will be prompted to login. Enter the credentials you used when you created your No-IP.com account. When logging in for the first time you need to select the host or group that you would like to be associated with this client. Click on the “Edit Hosts” button and select the host or group. Now, the host you selected will be updated with the public IP address of the network that the DUC is currently installed on. You can edit this any time after you save the settings by clicking “Edit Hosts” on the DUC v4.X. After you have selected your hosts and saved your settings you should see three green check marks. Three green check marks mean everything is working correctly. Your host will now be updated if your IP address changes. Note: If you are not running the DUC and your IP address changes No-IP.com is unable to detect a change. You need to be sure your computer and DUC are running at all times if you want your host to always be updated. To insure that your DUC always starts go to “File” on the DUC and click “Preferences” then check “Start this application automatically when this user logs on”. If you check “Enable as a system service” this feature will allow you to run the DUC prior to logging into your actual Windows account. This is a useful feature for users who do not leave their PC logged in at all times. 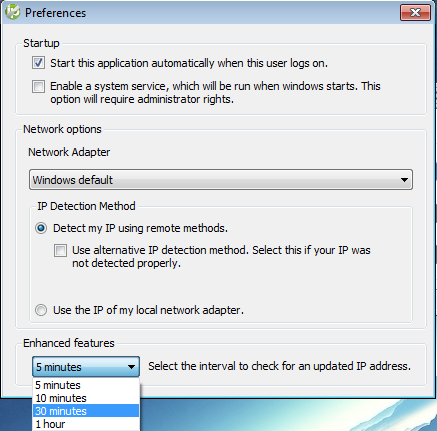 Checking “Use Alternative IP detection method” can help if your IP is not being detected correctly or if it is detecting the wrong IP address. 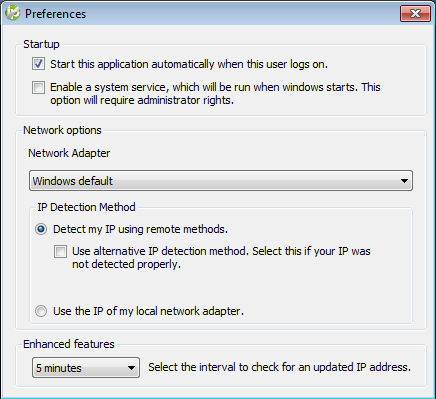 Along with “Use alternative IP detection method” is “Network Adapter”, it is best to leave this setting set to “Windows Default”, changing it can cause detection failing. As shown here, the update interval for the DUC can be configured to your liking. 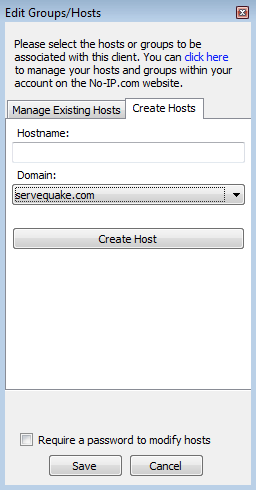 Additionally, Plus and Enhanced users can choose to create hostnames from the No-IP DUC interface.